The 54th Annual Meeting of Japanese Society of Pediatric Cardiology and Cardiac Surgery Date:July 5(Thu)-7(Sat),2017 Venue:PACIFICO YOKOHAMA(Kanagawa) President:H.Tomita,M.D. 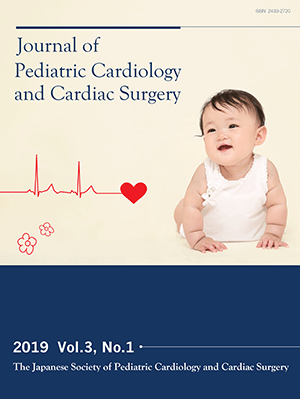 Inaugural Issue of the Journal of Pediatric Cardiology and Cardiac Surgery has been launched! The 53rd Annual Meeting of Japanese Society of Pediatric Cardiology and Cardiac Surgery Date:July 7(Fri)-9(Sun),2017 Venue:Hamamatsu Act City(Shizuoka) President:K.Sakamoto,M.D. The 52nd Annual Meeting of Japanese Society of Pediatric Cardiology and Cardiac Surgery Date:July 6(Wed)-8(Fri),2016 Venue:Hotel Tokyo Dome(Tokyo) President:S.Ogawa,M.D. The 51th Annual Meeting of Japanese Society of Pediatric Cardiology and Cardiac Surgery Date:July 16(Thu)-18(Sat),2015 Venue:Hotel Nikko Tokyo(Tokyo) President:Ben T.Saji,M.D.